Sodium hydroxide (NaOH), also known as lye and caustic soda, is an inorganic compound. It is a white solid and highly caustic metallic base and alkali of sodium which is available in pellets, flakes, granules, and as prepared solutions at different concentrations. 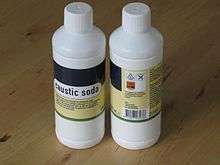 Sodium hydroxide forms an approximately 50% (by mass) saturated solution with water. 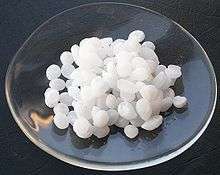 Sodium hydroxide is soluble in water, ethanol, and methanol. This alkali is deliquescent and readily absorbs moisture and carbon dioxide in air. Sodium hydroxide is used in many industries, mostly as a strong chemical base in the manufacture of pulp and paper, textiles, drinking water, soaps and detergents and as a drain cleaner. Worldwide production in 2004 was approximately 60 million tonnes, while demand was 51 million tonnes. Pure sodium hydroxide is a whitish solid, sold in pellets, flakes, and granular form, as well as in solution. It is highly soluble in water, with a lower solubility in ethanol and methanol, but is insoluble in ether and other non-polar solvents. Similar to the hydration of sulfuric acid, dissolution of solid sodium hydroxide in water is a highly exothermic reaction in which a large amount of heat is liberated, posing a threat to safety through the possibility of splashing. The resulting solution is usually colourless and odorless. As with other alkaline solutions, it feels slippery when it comes in contact with skin. Glass reacts slowly with aqueous sodium hydroxide solutions at ambient temperatures to form soluble silicates. Because of this, glass joints and stopcocks exposed to sodium hydroxide have a tendency to "freeze". Flasks and glass-lined chemical reactors are damaged by long exposure to hot sodium hydroxide, which also frosts the glass. Sodium hydroxide does not attack iron since iron does not have amphoteric properties (i.e., it only dissolves in acid, not base). A few transition metals, however, may react vigorously with sodium hydroxide. Aluminium hydroxide is used as a gelatinous flocculant to filter out particulate matter in water treatment. Aluminium hydroxide is prepared at the treatment plant from aluminium sulfate by reacting it with sodium hydroxide or carbonate. Sodium hydroxide can be used for the base-driven hydrolysis of esters (as in saponification), amides and alkyl halides. However, the limited solubility of sodium hydroxide in organic solvents means that the more soluble potassium hydroxide (KOH) is often preferred. 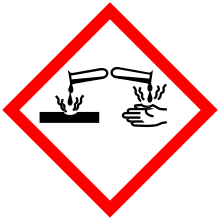 Touching sodium hydroxide solution with the bare hands, while not recommended, produces a slippery feeling. This happens because the oils of the hand are converted to soap. In a similar fashion, sodium hydroxide is used to digest tissues, as in a process that was used with farm animals at one time. This process involved placing a carcass into a sealed chamber, then adding a mixture of sodium hydroxide and water (which breaks the chemical bonds that keep the flesh intact). This eventually turns the body into a liquid with coffee-like appearance, and the only solid that remains are bone hulls, which could be crushed between one's fingertips. Sodium hydroxide is frequently used in the process of decomposing roadkill dumped in landfills by animal disposal contractors. Due to its low cost and availability, it has been used to dispose of corpses by criminals. Italian serial killer Leonarda Cianciulli used this chemical to turn dead bodies into soap. In Mexico, a man who worked for drug cartels admitted disposing of over 300 bodies with it. Sodium hydroxide is a dangerous chemical due to its ability to hydrolyze protein. 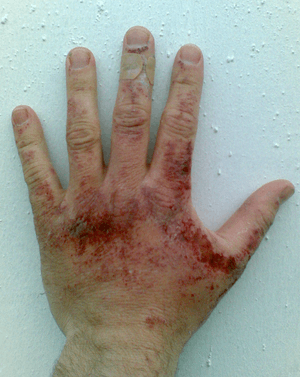 If a dilute solution is spilled on the skin, burns may result if the area is not washed thoroughly and for several minutes with running water. Splashes in the eye can be more serious and can lead to blindness. This danger is often overlooked. Sodium hydroxide is also being used experimentally in a new technology to create synthetic gasoline. Food uses of sodium hydroxide include washing or chemical peeling of fruits and vegetables, chocolate and cocoa processing, caramel coloring production, poultry scalding, soft drink processing, and thickening ice cream. Olives are often soaked in sodium hydroxide for softening; Pretzels and German lye rolls are glazed with a sodium hydroxide solution before baking to make them crisp. Owing to the difficulty in obtaining food grade sodium hydroxide in small quantities for home use, sodium carbonate is often used in place of sodium hydroxide. The Scandinavian dish known as lutefisk (from lutfisk, "lye fish"). 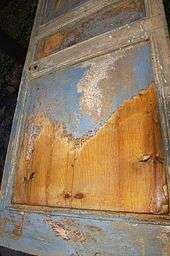 Sodium hydroxide is also mildly corrosive to glass, which can cause damage to glazing or freezing of ground glass joints. Careful storage is needed. 1 2 "Sodium Hydroxide – Compound Summary". Retrieved June 12, 2012. 1 2 3 "Material Safety Datasheet" (PDF). certified-lye.com. 1 2 3 "Material Safety Datasheet 2" (PDF). hillbrothers.com. 1 2 Zumdahl, Steven S. (2009). Chemical Principles 6th Ed. Houghton Mifflin Company. p. A23. ISBN 0-618-94690-X. ↑ "Sodium hydroxide". Immediately Dangerous to Life and Health. National Institute for Occupational Safety and Health (NIOSH). 1 2 3 "NIOSH Pocket Guide to Chemical Hazards #0565". National Institute for Occupational Safety and Health (NIOSH). ↑ "Sodium hydroxide solution". Sigma-Aldrich. ↑ Pubchem. "SODIUM HYDROXIDE | HNaO – PubChem". nih.gov. ↑ Kirk-Othmer Encyclopedia of Chemical Technology, 5th edition, John Wiley & Sons. ↑ Deming, Horace G. (1925). General Chemistry: An Elementary Survey Emphasizing Industrial Applications of Fundamental Principles (2nd ed.). New York: John Wiley & Sons, Inc. p. 452. ↑ "Document 2 - CausticSodamanual2008.pdf" (PDF). 2013. Retrieved July 17, 2014. ↑ Sample, Ian (16 September 2009). "Trafigura case: toxic slop left behind by caustic washing". The Guardian. Retrieved 2009-09-17. ↑ "Trafigura knew of waste dangers". BBC Newsnight. 16 September 2009. Retrieved 2009-09-17. ↑ Ayres, Chris (27 February 2010) Clean green finish that sends a loved one down the drain Times Online. Retrieved 2013-02-20. ↑ Roach, Mary (2004). Stiff: The Curious Lives of Human Cadavers, New York: W.W. Norton & Company. ISBN 0-393-32482-6. ↑ "Sodium: Getting rid of dirt – and murder victims". BBC News. 3 May 2014. ↑ William Booth (January 27, 2009). "'Stewmaker' Stirs Horror in Mexico". Washington Post. ↑ Morfit, Campbell (1856). A treatise on chemistry applied to the manufacture of soap and candles. Parry and McMillan. ↑ Andrew Hough (18 October 2012). "British engineers produce amazing 'petrol from air' technology". The Telegraph. Retrieved 21 October 2012. ↑ "Sodium Hydroxide". rsc.org. 2014. Retrieved November 9, 2014. ↑ "Hominy without Lye". National Center for Home Food Preservation. ↑ "Olives: Safe Methods for Home Pickling (application/pdf Object)" (PDF). ucanr.org. 2010. Retrieved January 22, 2012. ↑ "Drinking Water Treatment - pH Adjustment". 2011. Retrieved June 23, 2016. ↑ Brian Oram, PG (2014). "Drinking Water Issues Corrosive Water (Lead, Copper, Aluminum, Zinc and More)". Retrieved June 23, 2016. ↑ Page 168 in: The Detection of poisons and strong drugs. Author: Wilhelm Autenrieth. Publisher: P. Blakiston's son & Company, 1909. 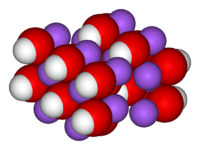 ↑ "aluminium_water_hydrogen.pdf (application/pdf Object)" (PDF). www1.eere.energy.gov. 2008. Retrieved January 15, 2013. ↑ Pubchem. "SODIUM HYDROXIDE | NaOH - PubChem". 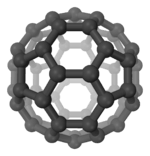 pubchem.ncbi.nlm.nih.gov. Retrieved 2016-09-04.